People increasingly demonstrate a disbelief in God. In a conversational style, apologist Scott Oliphint discusses why belief is still a preferable and more coherent position than unbelief and answers common objections to Christian belief. 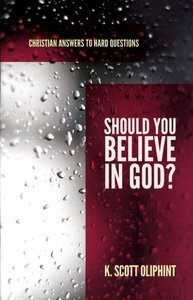 About "Should You Believe in God? (Christian Answers To Hard Questions Series)"
K. Scott Oliphint (Ph.D., Westminster Theological Seminary) is Professor of Apologetics and Systematic Theology at Westminster Theological Seminary. He is the author of Reasons For Faith; The Battle Belongs to the Lord: The Power of Scripture For Defending Our Faith; Revelation and Reason and If I Should Die Before I Wake: Help for Those Who Hope for Heaven.